swtt wrote: M40 is meant to get new services from 23/9, but the PDF uploaded only starts from 30/9! I suspect they got caught out on that as M40 is not a region 9 route but region 7 and hence got overlooked for 23/9 - I will raise that with them. pylelo wrote: 461 gets a noticeable increase with 15 minute frequency and increased services in the late evenings, and 20 min frequency on Saturdays. Basically from 7 pm - 10 pm from the city - which is far better than the appalling 30 min frequency at the moment. Which means the evening frequency is actually better than the weekday daytime off peak frequency of 20 min! The 400/410 timetables, compared with the new 400/420 timetables are an interesting comparison. Currently there are 9+3 departures in total from Bondi Jn between 1600 and 1659, route 400 and 410 respectively. Three departures are route 410. Nine departures are Eastgardens short runners. Equivalent departure time from Eastgardens, for what would've previously been a 410 departure would be 1643-1742 Eastgardens time. Of which there are three of them for route 420. (the 420 TT is a pretty consistent all day 20 min service, 30 min night and 60 min late/overnight). 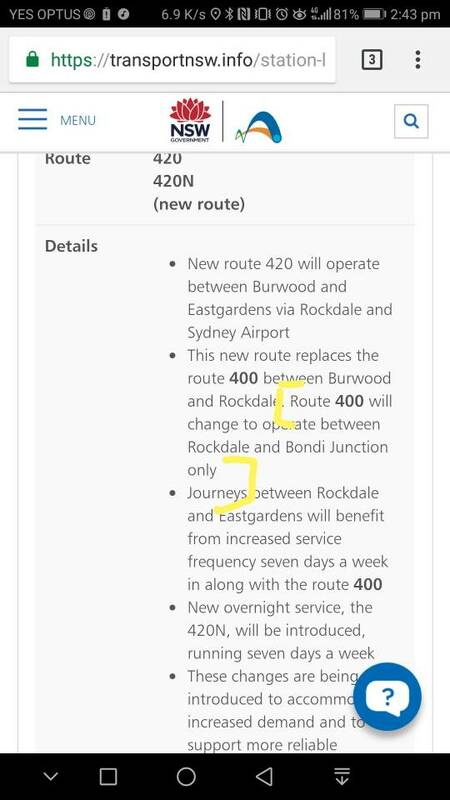 However, in the off peak it's a bit annoying: every departure of a full length Airport - Bondi Jn service of route 400, seems to be timed within minutes of an equivalent 420 service, leaving a sparse 17-18 minute gap. swtt wrote: The 400/410 timetables, compared with the new 400/420 timetables are an interesting comparison. M40 new weekend timetable has highly irregular intervals. I think someone must have uploaded the wrong data feed. Thanks - the woes of copying/pasting! Based on the timetables I've seen, I'm not a fan of the changes. I understand there are operational requirements but is it that hard to timetable the 400/420 to run at 10 minute intervals between the Eastgardens and the Airport? I also note that although there are the same number of buses departing Bondi Junction each hour, there will be a reduction in buses running between Bondi Junction and anywhere between Eastagardens and Mascot each hour, with less than half as many buses going beyond Eastgardens. Many people travelling between UNSW, Kingsford and Maroubra to Mascot or the Airport are going to find this is a major service cut. They're now meant to interchange at Eastgardens for 420 Based on the fact that Opal transfers are free...until you have luggage involved in which there a massive "penalty" in terms of convenience. With the chaotic on-time running, I don't think it will much difference no matter what interval is timetabled. I thought all 400s were to terminate at the Airport? swtt wrote: They're now meant to interchange at Eastgardens for 420 Based on the fact that Opal transfers are free...until you have luggage involved in which there a massive "penalty" in terms of convenience. There will still be 3 services per hour from BJI to the airport, why would pax need to change, unless they hoped to save a few minutes in travel time? A correction to this was posted earlier. For 533, there are only a few extra short workings. This is much less than my expectation. I hope Transport NSW will seriously consider introducing 7-day services. Also the 420N doesn't seem to exist, unlike the 333N which actually has a published timetable. T1 Western Line - Richmond trains will not stop at Lidcombe between 4am and 10pm. T5 Cumberland Line - The weekday 3:28pm and 3:58pm Schofields to Leppington services will instead start at Blacktown at 3:43pm and 4:13pm. Weekends services will continue run between Liverpool and Quakers Hill. T8 Airport & South Line - Revesby will be added as a stop on two existing T8 Airport & South Line services from Macarthur via Airport stations in the monring peak. South Coast Line - 1:55pm service from Kiama will terminate at Martin Place instead of Central and 4:24pm Central to Kiama service will start from Martin Place at 4:20pm. Southern Highlands Line - 4:01pm Central to Goulburn service will now leave from Central at 4:00pm. Central Coast & Newcastle Line - Services will no longer stop at Burwood and Eastwood in response to customer feedback. T2, T3, T4, T6, T7, Blue Mountains and Hunter line will stay a same as normal. There are a lot of timetables which do not yet exist such as all the SL ones and also all the new Central Coast ones I have tried are not there yet and probably others I have not tried so far. With as many changes as this I'm not surprised some things were left off/there are last minute changes. stupid_girl wrote: For 533, there are only a few extra short workings. I agree with this - replacing existing 534's like for like with the 533 would be great to support the 'Ryde' section of the route with Rhodes Station. It would also support the developments in Wentworth Pt and Church St and have more people consider public transport - especially late at night. The 420N trips appear to be in the 420 timetable as it operates all night with overnight services not operating via the Domestic terminal. Also surprising the 420 does not have any weekday wheelchair services and also on weekends there are not many such trips. The new 136 timetable has several early morning trips departing Chatswood before the first service ex Manly arrives. So we will either see a lot of special running ex V or possibly the debut of M depot on full length 136s. Same for reverse direction at night. T1 timetables copy for 30th September is now available at Macquarie Park Station. Hmmm. Looks like 420N may be a late withdrawal - it's wording on route 400 seems to imply that. 420N is still mentioned lower down and as said before its timetable is included in the 420 timetable. And the 400 description is still wrong as it will only operate to the Domestic Terminal. Fleet Lists wrote: 420N is still mentioned lower down and as said before its timetable is included in the 420 timetable. And the 400 description is still wrong as it will only operate to the Domestic Terminal. All of the information including the maps and timetables suggest International for the 400. Are they really going to change it again? Fleet Lists wrote: The 420N trips appear to be in the 420 timetable as it operates all night with overnight services not operating via the Domestic terminal. Also surprising the 420 does not have any weekday wheelchair services and also on weekends there are not many such trips. I guess that could be due to a plan to run the route with the 14.5s? Fleet Lists wrote: And the 400 description is still wrong as it will only operate to the Domestic Terminal. Incorrect - the 400 will terminate at the International Terminal (operating via the Domestic Terminal).